Any kind of pain can be concerning and uncomfortable, especially in the abdomen. Abdominal pain can range from mild to discomfort to debilitating. There are many different conditions that can cause you to experience sharp pain on the lower left side of your abdomen. Diverticula are usually small, harmless pouches that can develop in your digestive system. Sometimes the diverticula can become inflamed or infected, causing pain in the lower abdomen. Additional symptoms include possible nausea, fever, vomiting and constipation. This condition in a mild form may be treated with rest and medication. More severe cases may require surgery. Celiac disease is an autoimmune disorder that is a severe intolerance to gluten. People who have celiac disease may have damage to their small intestine caused by the bodies immune system battling any ingested gluten. This response can damage the villi in the small intestine which is responsible for nutrient absorption. Celiac disease can cause pain in the lower left abdomen as well as gas, constipation, nausea, vomiting, cramping, skin rashes and weight loss. There is no easy solution to celiac disease short of avoiding all gluten. If celiac disease goes untreated, it can develop into other autoimmune disorders. Lactose intolerance is caused by the body’s inability to break down and digest lactose. If you are lactose intolerant you typically experience symptoms such as gas, bloating, nausea, abdominal pain and vomiting. There is no way to completely remedy this condition however over the counter aids can assist in digesting lactose. Sufferers should steer clear of lactose products to avoid discomfort. Irritable bowel syndrome is a chronic disorder that affects the large intestine. The intensity and symptoms of IBS can vary dramatically. Common symptoms of IBS include abdominal pain, cramping, gas, constipation, diarrhea and mucus in stool. IBS can be triggered by stress as well as foods. A hernia is caused when an organ or tissue breaks through a weak spot in the surrounding tissue. Hernias occur when there is both pressure and a weakness of the muscle. If left untreated, hernias can become worse and create serious complications. Pain in the abdomen as well as weakness or a burning sensation are common. Hard deposits usually made up of minerals and salt develop inside the kidney. Kidney stones can be extremely painful to pass. You may not experience any symptoms at all until the stones move around or you attempt to pass them. Once this happens, symptoms may include intense lower abdominal pain, pain when urinating, frequent urination, nausea, and fever. If you have ever had chickenpox, you have the shingles virus. It may lay dormant for many years but can reactivate as shingles. While shingles can appear on any part of the body, it most commonly appears as a strip of blisters along the torso. Symptoms of shingles include pain, sensitivity to touch, fluid blisters and rash, along with itching. Pain is typically the first symptom and can easily be mistaken for other illnesses depending on the location. How can something so simple be so painful? Excess gas trapped in your abdomen can occur from simple activities such as chewing gum, smoking, taking in too much air and overeating. Certain foods and illnesses can also create gas. Aside from remedying any embarrassment and discomfort you experience, you should consult a doctor if you have additional symptoms such as fever, vomiting, diarrhea or weight loss. Sharp pains in the lower abdomen frequently accompany a woman’s menstrual cycle. This pain can be easily managed or excruciating depending on the person. Over the counter medications, a healthy diet and relaxation techniques can all be utilized to help minimize discomfort. Endometriosis is a condition in which the endometrial tissue develops outside the uterus. Endometriosis is usually isolated to the pelvic area including the ovaries, fallopian tubes and tissue. It is accompanied by severe pain occurring around the same time as the menstrual cycle. Symptoms of endometriosis include pelvic pain, excessive bleeding, and infertility. Ovarian cysts are fluid filled sacs that form on the ovaries and are often harmless. If you do experience symptoms or a cyst ruptures, you may have sharp pain, swelling and bloating in your abdomen. There are many different conditions that can cause abdominal pain. Making matters even more complicated, they often share more than one symptom. The first step in treatment is an accurate diagnosis. Track your symptoms. The first step in identifying the root cause of your pain is accumulating as much information as possible. Write down when your pain occurs, and any other factors that may give insight such as meals you’ve recently eaten, particularly stressful events and any other symptoms that occur. The more information you have, the higher your chances of successfully identifying the cause. Consult a medical professional. If your abdominal pain is accompanied by other symptoms such as fever, inability to hold down water, constipation, diarrhea, or is reoccuring with no known root cause, contact your doctor. A skilled medical team will work with you to alleviate and identify the cause of your pain. 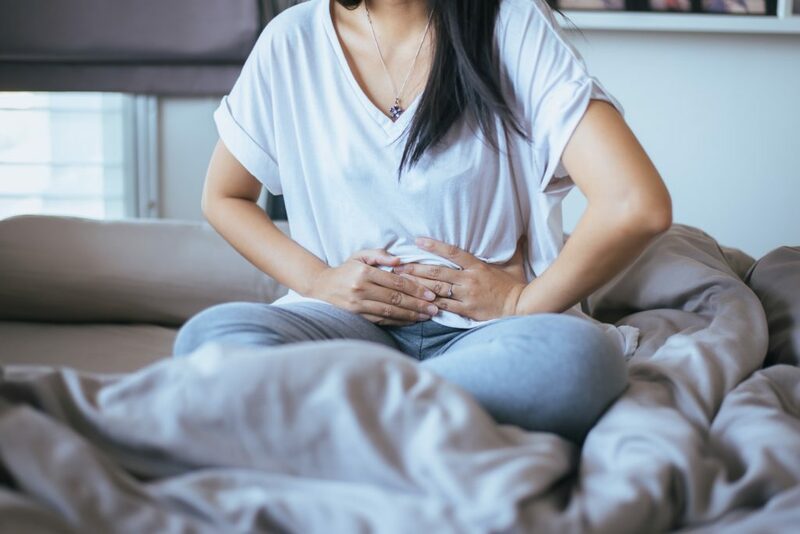 Because abdominal pain can be a symptom of a wide range of issues, it may take time and a comprehensive treatment plan to fully address the underlying illness. Adjust your lifestyle. Some pain can be corrected with lifestyle changes. Prioritize your physical and emotional well-being. Focus on eating several smaller, healthier meals. Get enough exercise and rest. Reduce your external stress wherever possible. You don’t have to endure abdominal pain. If you are dealing with abdominal pain, contact our office today. Our medical team has the experience and skill to help accurately diagnosis the underlying issue so that together, we can successfully treat and eliminate your pain.